It is a common mis-conception to think that Shaolin Kungfu is just “hard”. Notice that Molly's effective defence and counters against Eugene's attack are “soft”. Grandmaster Wong also reminds Molly to take advantage of her favorable situation if she manages to catch an opponent's kicking leg. There are many ways you can take advantage of the situation when you have caught your opponent's leg in your hands. You may kick at his groin, dislocate his ankle, break his leg or merely throw him onto the ground. You should practice these counters beforehand so that when the situation arises, you can apply them without hesitation. 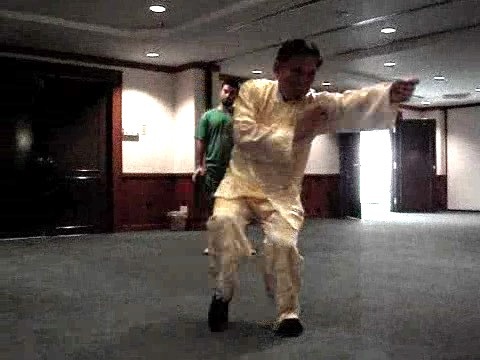 Grandmaster Wong advises Molly not to be too close to an opponent so that he cannot strike her when she tries to fell him. If she has difficult in felling the opponent, she could drop the leg and strike him. Molly should also be prepared for the various possible counter-strikes the opponent may make, so that if he makes them, she can respond spontaneously. We can respond spontaneously and correctly to an opponent's random attacks because we have been trained to do so. In the basic training, when an opponent executes a punch, we spontaneously and correctly respond with “Single Tiger”. Here we choose the relevant responses from our specialized sets. In theory, attacks can come in countless ways. But in practice the great majority of attacks can be classified into a few broad categories. Hence, once we understand and are able to respond spontaneously and correctly to these categorized attacks, we can do so to almost all attacks. Molly responds spontaneously and correctly to typical attacks a Karate exponent, posed here by Eugene. She can do so due to her systematic training. Grandmaster Wong reminds Molly to executes her counter-attacks continuously, without hesitating between attacks. Eugene initiates with two kicks, followed by a thrust punch. Molly avoids the kicks, lean on the punch, and counter with “Fierce Tigers Push Mountain”, pushing the opponent away. Alternatively, Molly may strike the opponent with her double palms. Here, before Molly moves in to push away Eugene, Eugene adds another punch. Molly just has to ward off the additional punch and continue with her planned response. Such a step is called a modification. With practice the modification can be executed fluently. The size of the video clip is 0,84 mb. Some Important Combat Philosophy and Principles from Wong Kiew Kit on Vimeo.